Fastbuy – Megashop eCommerce Bootstrap 4 Template is literally a wide and complete HTML template to build an eCommerce shop beyond the trend. You can use this template to sell Electronics Products, Gadgets, Kitchen Appliance, Furniture, Books, Mobile Phones, Cameras, Fashion Products and almost all kinds of products that you can imagine. 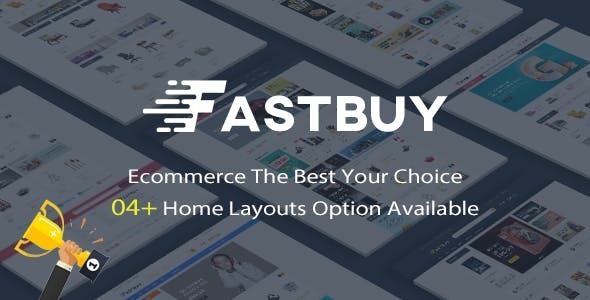 Fastbuy is such an amazing template that visitors will be in love of it at the first sight. However, this template comes with 4 Homepages, 14 Shop Pages, 9 Blog Pages & 9 Other Pages totaling to 36 HTML Pages. Fastbuy is powered with HTML5, CSS3 and Bootstrap4. Moreover, Fastbuy has User Friendly Code, Clean Markup, Google Font, Google Map, Amazing Mega Menu, Smooth Animation, W3C Validate Code, Well Documentation and no console error. Besides, this catchy HTML template has Cross-Browser Compatibility, 100% Responsive Layout. Other thing that you will enjoy is its Fast Page Loading and Easy Customization. So, keep trust on Fastbuy – Megashop eCommerce Bootstrap 4 Template and make a boom with your business.